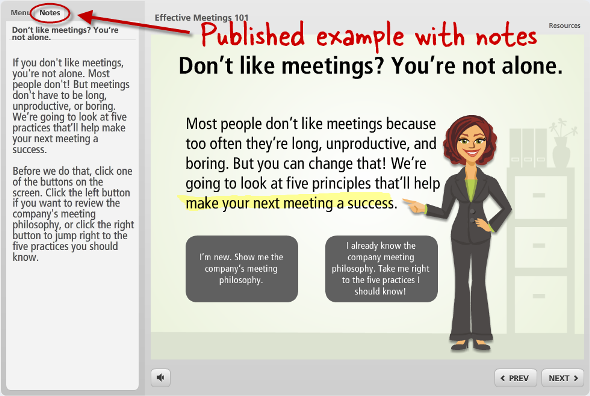 Storyline allows you to add notes to each slide, which can be made visible in your published story. This is useful if you want to provide a transcript, supplemental information, or instructions in your course. When you're in Story View, double-click the slide you wish to edit, which will open the slide in Normal View. If you are already in Normal View, select the slide you wish to edit from the left navigation pane. If the Timeline, States, and Notes panel isn't already visible below your slide, expand it by clicking the arrow in the lower right corner of the slide stage. Then select the Notes tab. Type the appropriate text into the Notes panel, or copy and paste text from another source. 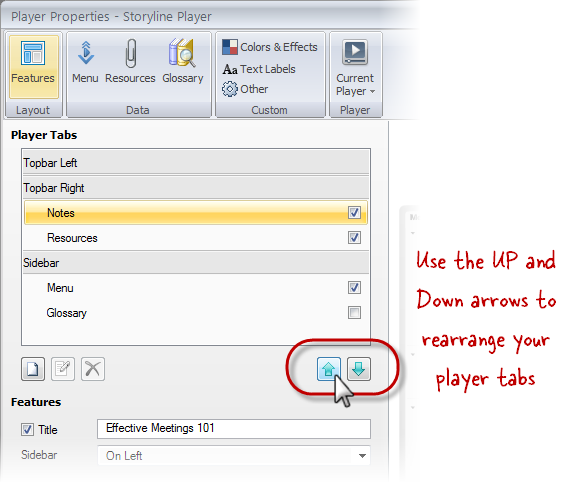 Tip: When you import a PowerPoint presentation or another Storyline story that contains slide notes, the notes from the source content will also be imported into your new story. Go to the Home tab, and click the Player button. The Player Properties window will open to the Features editor. 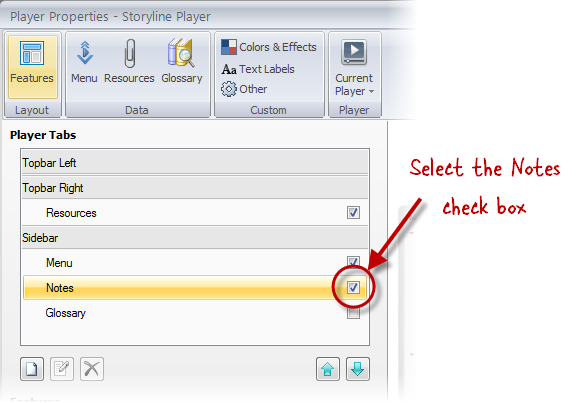 To display notes in your published story, select the Notes check box. By default, notes will appear as a tab in the sidebar, but, if you prefer, you can use the Up and Down arrows to move your notes to the Topbar Left or Topbar Right. Click the OK button to save your changes, and then publish your story. For more information on customizing the player, click here.